As with all things in my life at the moment, I only find I can give a little bit of time to something before being pulled away by something else. I try to devote myself to lit searches for background writing of my dissertation and get pulled off to start looking at prelim confirmation data and get pulled even further off when I start digging into determining why it doesn't match the original data... Then when I start to get it all slightly back to normal, I take our oldest cat to the vets (he's loosing weight) and find out he has hyperthyroid. Follow that up a few days later with our phone and internet going on the Fritz requiring me to stay home Monday and wait for the repairmen. All and all I need a little normal... And so I post this. 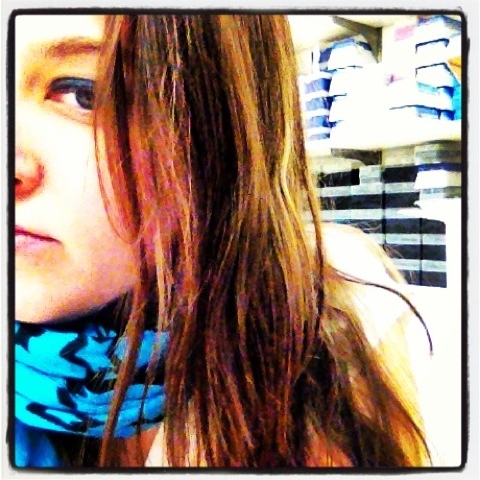 A self photo I took when Paper Mama first put up the challenge. =) A little bit of normal to me is balancing all this science with a little bit of artistic nature. And I find when I'm obsessing over science that I start to daydream by reading through artsy blogs such as http://thepapermama.com. I think I may start blogging again. Mabye turn her 52 weeks of drawings challenge into a way to de-stress when I've got my nose too close to the science to see what I really need to be focused on. Stressed. Too much to do, not enough time and running out of steam. Finishing my PhD dissertation. Aka lots of reading, data analysis, compilation and writing while still trying to run a household. Getting caught up and maybe graduating in May. Possibly also doing something nice for my 32nd birthday that falls on Easter this yr. Planned on defending my thesis around then but that would require a miracle &/or a time machine. NPR. I've found streaming this is a good way to multitask and get a little bit or world news/interesting stories. I had 3 of myself to tackle it all and succeed. Can you be their new forever home? After a friend mentioned seeing one of my kitty flyers still in the student lounge at school, I realized I need to update. And this will be the last. Misty is still with us. And doing well. She's not wanting to interact with our cats but loosing weight or at least chubb on her special diet. When her owner does find her way to be stable (Job, home, etc), she will be flying back to her and her daughter. While we did invest $1K into lil miss kitty, we can't keep her. She's not ours and while sweet to us, the plan to not keep her and separating her from them in the beginning has led to her hating our cats. They're interested in her but all she does is hiss and growl at them when they are anywhere within 3 feet of her so she is living separate from them as we can't have a cat fight on our hands. At any rate, she is happy in her little roost until she goes back to her family. ****11/28/12 Sorry... it's been quite hectic between getting two cats better and dealing with a death in the family. I should have updated but was so behind on everything as life keeps mixing it up. As for Lola... I've been in contact with a woman from the shelter who posted better pictures of her. (Her original photo just looked so sad with her hiding in her litter pan.) I was given updates on Lola and how she was acting in the cat garage. She seemed to be ok. Not super friendly or happy with the cage but if given a lap, she was a happy little ball of purr. And guess what... She's been adopted! Yesterday! =) Fingers crossed Lola plays nice with her new 7yr old sibling and stays in her new forever home! ****10/30/12 Kitty update: As far as I know, Lola still has yet to be adopted. I have checked the page every other day and still see her up there. But as she is in the main adoption area for cats now (I think it's the separate building that is just cats) I think she won't be as freaked out without Misty since she will no longer have barking dogs around her. As for Misty, we took her to our vet last night for an exam of her mouth. The vet found 5 teeth that need pulled. One has a really bad abscess and the other 4 have cavities near gum level where the gum is starting to grow into the tooth. All and all it has to be really painful for her, which explains why she was grumbling after eating hard food or while trying to eat wet food with chunks. We're feeding her only pureed food now. Our vet gave her a convenience antibiotic shot that will last two weeks so it's one less thing I had to shove in her mouth and they also gave us liquid pain meds to put in her mouth twice a day. While the antibiotics and pain meds start to help her feel better, the vet is scheduling with the traveling dental vet who will come in to extract Misty's teeth. We were given the option of either having Dr. Showalter (Who I've heard from animal friends and WPHS is one of the city's best dental vets) come to the Big Easy for her or to take her to PVSEC for the best dental doc in the burgh that does xrays and beyond. While we want her on the mend and would love the best, the best would easily be over a $1,000 and we don't have that to spend on our own cats let alone a foster cat. Dr. S is the second to best and while he may not have the crazy x-rays, there's a good chance that he will be below 1k (Btw... If anyone wants to help us out with Misty's dental care, we won't turn anything away as we were expecting at most $400 assuming she'd have maybe one bad tooth. But with 5, who knows. One doc I called gave me an estimate of $100 a tooth when I was calling for cost of dental cleanings). Plus she'll be going back to a familiar vet's office and a shorter car ride. Other than the bad teeth, Misty has been doing quite well. She's been warming up to us each day and has been ever so playful. She loves the krinkle ball from petco that we picked up for her and rolls around in her box when we give her pets. She even gave me a head bump on Sunday morning. She still is slow to venture far away from her box (a cardboard ABI box on it's side with a towel and fleece blanket in it) as it's her fort. But at times she's wandered down the stairs in search of us when we weren't around as we haven't let her out into our general cat population yet and probably won't until after she's on the mend while we are still trying to find her a home. ****10/25/12 I picked Misty up yesterday and have found a temporary solution for her. She is getting antibiotics for her gingivitis and we are checking around to find the most affordable dental treatment. If anyone knows of any, let me know. If her mouth is as bad as the ARL led on, this is going to be quite costly. And with all the other expenses we have this month (3 cats due for exams/vaccines plus I have a car inspection and at least 2 bald tires that need replaced), we are strapped for cash. We are also checking around to get her on a wait list for a shelter that won't turn her away due to the possible chronic gingivitis and age. The idea being that she can be foster in a home until adopted through the shelter as she doesn't do well in cages. She goes from loving cat to defensive. But for now, the big issue is getting her well. Then finding her a home. As for Lola, the ARL processed her and she is now adoptable. Animal Details If her status changes, I will update with that. ****10/24/12 10am: I checked our answering machine this morning as I hadn't noticed it blinking before now (It's mounted above my line of sight on the wall.). The ARL called Monday about Misty. She has severe gingivitis with bleeding gums. Because of her age and that, she can not be listed as adoptable. I called and left a message first thing this morning saying I'd take her back and not to put her down but I don't know how long they wait after contacting. If she is still alive, we can hold onto her temporarily but need someone willing to take care of her or adopt her. I assume as I haven't heard about Lola that she has been vetted and is now in the shelter. I'll update after they call me back or I call them at 11am. ****10/23/12 Here is the flyer for anyone who wants to post it around. Click for full size printable version click here and click actions then view all sizes. Under view all sizes, the original is 8.5 by 11 in size. It can be downloaded or printed from there. **** 10/21/12 A neighbor mentioned to me that even though the kitties are in the ARL, that open door shelters utilize fosters to minimize the stress on a cat. Less stress means they will be less likely to get sick. 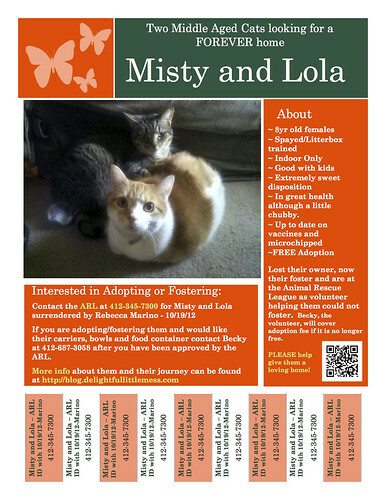 If anyone is interested in serving as a foster for Misty and Lola while the shelter promotes them, information can be found here on their foster page. The ARL will provide all medical care free of charge and food/litter when they get donations. I've also created a flyer with rip tags to post for promoting them for adoption. I'll figure out how to put downloadable copy on here for anyone interested in putting flyers up in their area (Vet, coffee shop, church bulletin board). **** 10/19/12 7pm Misty and Lola were checked into the Animal Rescue League at around 4pm. They were allowed to keep a towel along with their butterfly and penguin toys. They weren't happy and neither was I... It's the worst feeling having to leave a good pet at a shelter even if they aren't your own. They are available for adoption now but may not end up on the website until next week and they may not be in the main cat area until then as well (I'm sure the ARL has screening to make sure cats that end up in the main population aren't harboring any illness). But they can be adopted tomorrow if someone is interested in giving them a good home. As you may not be able to find them yourself if they aren't out for view, all you need to do is ask for them using my name (Rebecca Marino). They will be able to pull them up and find them for you. Also I have their carriers, bowls, litterbox and food storage container. So any interested party can contact me and I can meet you when you go to get them with their supplies if you want. Currently the adoption is free and for Senior cats it has been free all summer. I've been told that they don't have any plans to discontinue it either. If they do, it is only $30 per cat and I will come out and pay for it. Please continue to spread the word for them to find a good home. They are oh so sweet and don't need to be in a shelter for the second time in their lives. 2pm Update: Taking the kitties to the ARL this afternoon after 4pm. It will give them the best chance to get exposure with Saturday's free adoptions. And hopefully lola's purring and loving attitude will help. Sadly I was told that as they are on the edge being of senior cat, that senior cats are less likely to get adopted at this time of year. And as long as they remain healthy, they won't be put down. But if they get an upper respiratory infection and they don't have the room to treat them then they put them down. Adoptions Sat are free and $30 after that. But I will pay their adoption fee if that is holding someone back from taking them. They are too sweet to end up being stuck in a shelter for so long that they get sick. ****10/18/12 I picked the cats up but ARL closed before I could take them over. They are hiding in our basement now with food, water, toys, & litterbox. I will be taking them to the ARL sometime tomorrow. If you wish to rescue them and give them a loving home, please call me 412*687*3058. OR email at rsbosko[at]gmail[dot]com. They are ever so sweet. I was able to stick them into my carriers with no trouble and they barely meowed at all the whole ride home from Bridgeville to the city. FYI. The animal Rescue league is having an adoption special Saturday with free adoptions on all animals. These little girls once there will be chipped and updated on vaccines and could be yours for free. If you rescue them on saturday. They are ever so loving and would do well with a family with kids. They will also do well with other cats as they didn't hiss at mine when I first brought their carriers in. I think they may also do ok with dogs but that lola just didn't like the foster dog. He was a bit barky. At least when I went in, anytime I was around he would not stop barking even after sniffing my hand. ****10/18/12 URGENT!!!! The foster who was going to take these cats to the ARL left her husband and the state yesterday. Her husband landed himself in jail and I need to go rescue the cats from the house. They NEED a home tonight or else I will have to take them to the ARL. I can not house them in my house as I'm at the city limit for animals. PLEASE help if you can. I'm out of options. A friend of mine who recently graduated is facing the end of her post graduate temp position at the end of the month (End of August) when the funding runs out. As she has yet to find something permanent with her degree and her lease ends then too, she's looking to move home with her daughter to her mom's and won't be able to take her two 8yr old cats. 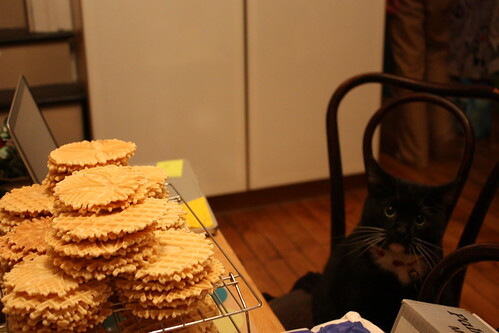 It's not that she doesn't want to take them but that her mother is allergic to cats. She had planned to take them to a no-kill shelter this weekend but I convinced her that we can find them a home. While no-kill shelters are good, they are becoming overcrowded and can't necessarily take in these girls. 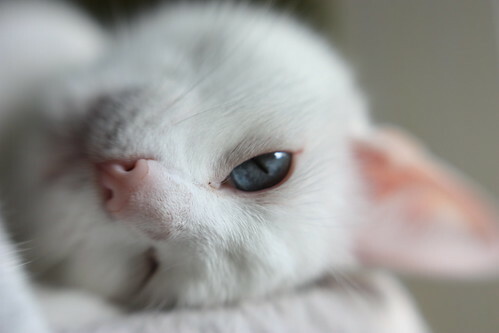 In addition to that the older the animal, the harder it is to get them adopted as everyone wants a cute young pet. So it is best to keep these little sweeties out of a shelter. And that is why I ask, can you help us find a new forever home for Misty and Lola? Thanks for trying to help. The orange/ white is Lola and the dark gray is Misty. I believe Lola is a tailed Manx or also known as a Cabbit (cat rabbit) because she looks like she is hopping when she runs. Misty I believe is a Tabby. 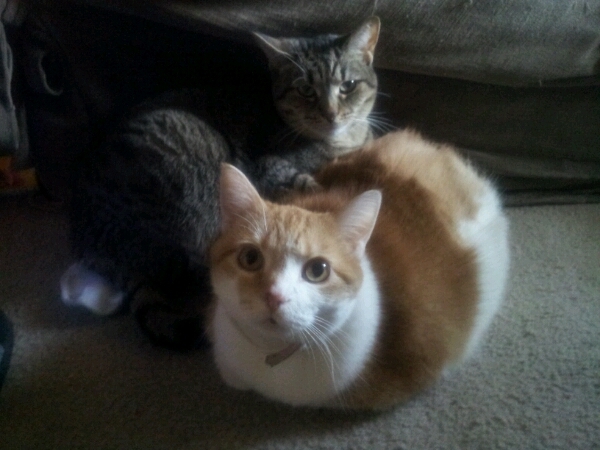 They were adopted from the Wisconsin humane society and are both spayed and microchipped. They are 8 yrs old and have been living together for 4 yrs. They are STRICTLY indoor cats and have not been around other animals. They are not up-to-date on vaccinations (3yrs) and that was when they were last tested for leukemia (neg). They have calm personalities and hate closed doors including the bathroom but they just stand their quietly until you come out. They are very good with a rough child. My daughter drags them around the house (literally) and they purr so loudly. They are very affectionate, especially Misty (who I also call my Cuddle Kitty). Misty will collapse like a house of cards as soon as you touch her. 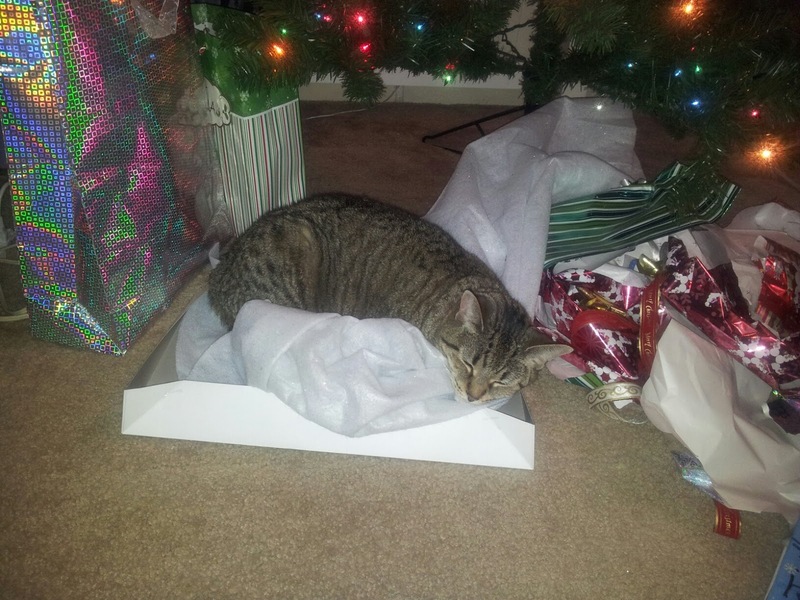 They will not scratch furniture as long as they have their own scratch post or box (I use a box on the floor). They are litterbox trained. Lola love to play with leafy greens (I know it is weird but I make a lot of salads). Misty like plastic (so you must be careful about small wrappings like those from bottles) and laser pointers. Also their current owner will be traveling across country and if you are on her route to Las Vegas, NV, she could meet up with them and all of their belongings (litterbox, food dishes, toys, etc). So can you help? Ask around please. See if anyone is looking to fill a hole in their heart with loving balls of fur. If you do know of someone or are the someone who would love these tame girls, please comment below with your contact info (Name, Email/phone, and anything else you would like to say). You can also email me at rsbosko@gmail.com and I will get you in contact with their current owner. ps. We are in Pittsburgh, PA btw. But could transport them to surrounding states if needed. So anyone in NY, DC, Philly, Cleveland, etc... Also she will be traveling to Vegas so any city along the route is a possibility too. Local is preferred but as it draws closer to the end of the month, we will be in dire need of finding them a home to keep them out of a shelter. PPS. Oh and for those of you who may grumble that you'd never get rid of your pets consider her circumstances. She graduated 7 months ago and has been submitting resumes/applications non-stop since then. She found a temp laboratory position 2 months back but for that 5 month period was living off her savings. She's now broke and once the funding for this position runs out, she has no job and no income. The only option is to move home to her mom's and her mom is allergic. She's asked family but none want the cats and even gave her grief when she told them that she was going to drive the cats to a no kill shelter in Ohio (the closest no-kill she could find that would take them). She's out of options and doesn't want two sweet kitties that her and her daughter love to face being put down. That's why we are reaching out via social media. They are great indoor cats, older so they won't be as annoying as young ones and they have each other so they won't be quite as needy as a single cat. Three years back when my uncle passed away, that side of the family had to clean out his family (my grandmother's childhood) home. In doing so they found my great grandmother's treadle. Originally my aunt was going to take it but decided she didn't have room, so she offered it to me. Of course, I said yes. Who wouldn't say yes to an antique foot-powered sewing machine owned by their great grandmother? Sadly I let my Aunt put it in her storage space rather than taking it right then. Had I been more wise about rust, I could have saved myself a world of trouble by not letting it sit there for 3 years. But hindsight is 50/50. 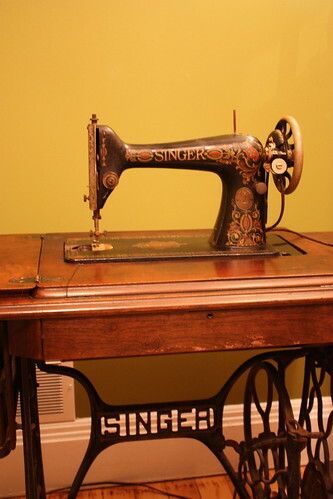 At any rate, it's a 1920's Singer Red Eye Treadle model #66. =) Produced in a lot of 50, 000. Or so says the source I found this at during my intense internet search that I can't find again. Knowing the model (or what I thought was the model before I realized there were numerous versions of the 66), I went about beginning to clean the machine head this weekend. I unscrewed the machine head from the frame. Took off all the face plates and proceeded to vacuum up the lint balls with the shop vac. Anything that remained I pulled out with forceps. Then I went on to soak the internal mechanics in liquid wrench (a penetrating oil). At first I applied it with the little hose adapter but then just started spraying away. I sprayed in each of the oiling holes and in all the panels until it was dripping into the disposable oil pan I picked up specifically for this. After everything got a good soak, I began scrubbing with an old toothbrush to loosen the old black grime (which I've been told is the remnants of old oil). As the toothbrush wasn't removing the oil, I then wiped those spots with clean cotton balls to pull the oil off. Had I been thinking, I would have used the old lab forceps I have to cotton ball further in. Or even grabbed a q-tip for those hard to reach places. But I was running low on light and didn't have the time to meander. Once again... hindsight for a future date of re-cleaning. After that I oiled everything up very liberally with sewing machine oil in all the holes and at all the joints such that it was dripping out of the machine. And I ran it for around a minute to get the oil into the joints. I also wiped the paint down will a bit of liquid sewing machine oil as well in the case that I got some liquid wrench on it. Once they are up on this blog, you will find them below this. 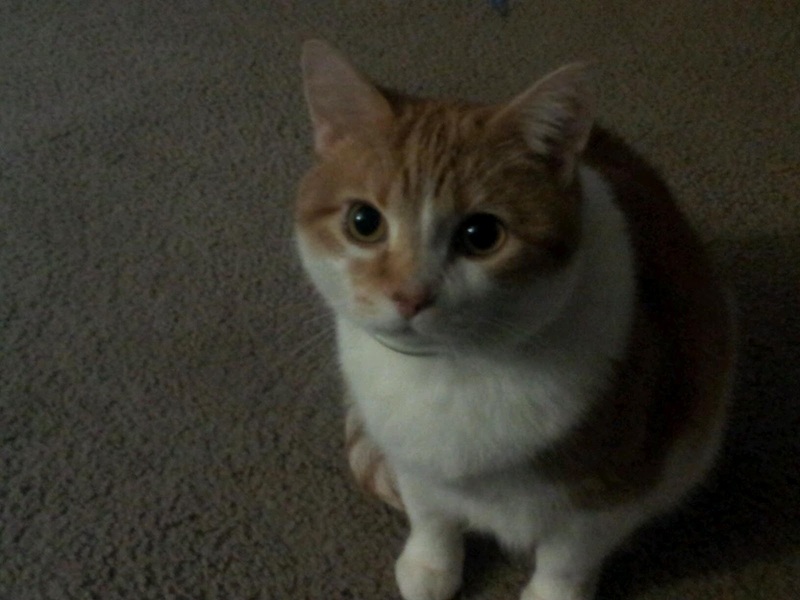 I had originally intended on writing a post about our feelings of missing Scout and moments where we notice him gone. Or how a song can invoke such a feeling of sadness because it reminds you of that someone. For instance, I was listening to my Joy Ike playlist this week and her "city lights" song came on. This song originally made me think of a photograph I named city lights where Scout was looking out the window at winter towards the city and it's sparkling lights. I instantly began to cry in lab after realizing I'd never see him doing this again. But sadly this isn't that post. It's more a post of anger and outrage at the less than dedicated pet owners. The ones who are moving and either don't try hard enough to find a place to allow pets or don't care enough to take them. I'm not referring to those going internationally or going into the milliatary. Those are slightly harder situations to take a pet. I'm talking of the ones that move domestically and then give their pets to a shelter. Or those who move in with someone who doesn't have a pet allergy but just doesn't like them so the pet goes. I'm sorry but adopting an animal should be like adopting a kid. You assume all responsibility for that individual for as long as they live. You don't have to go overboard like we just did trying to save the life of that pet but there should be an understanding that there is NO Backsies. You should adopt the pet only if you are willing to keep that animal with you for the 10-20 years they will be alive. Giving an older animal to a shelter (aka anything that isn't a cute fluffy kitten) is a death sentence. People going to adopt, go for the kittens and puppies, not the older ones. So the older ones grow old in the shelter, get shelter shock, or are euthanized. Why? Because you didn't try hard enough. So if you are considering picking up a cute kitty or puppy... Rethink it! Pretend you are looking to adopt a child. Are you ready for a commitment to that animal? If not, then don't. Someone else will love them. And don't tell me it's the cost of food and all. We feed prescription food which is expensive. But back when I did meow mix, it was around $10 for a huge bag. That lasts one cat 4 months. And same with the cheaper litter. Plus vet visits use to be maybe once every 4 yrs when I had the cash. Doing the minimum needed for a happy cat is cheap. I understand if you become allergic to your cat and have to give them up... But otherwise, Commit or don't get! Ok... end of rant now. As I write this, I feel so nauseated and sick. It's like this is all a really bad dream that I'm bound to awake from... that we need to awake from. We've been crying so much that my sinuses literally feel like they will pop. And any pain I'm feeling now, I know is ten times worse for my husband as it's his kitty who is in trouble. 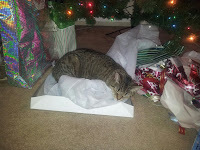 Our 2.5yr old human loving cat, Scout, is a very very very sick kitty. It began with him acting listless, weird, not eating and having mobility issues last night when we got home from DC so we took him to the vet this AM. After X-rays, blood panels and poking, we find that he has an enlarged spleen and very low hemoglobin levels. So low that he could be facing respiratory failure. We took him from our vets to the emergency vets down the street and the whole time I was thinking "Not again.... not another young one to acute illness.". Sadly my hopes did nothing... Scout has leukemia. Scout in his favorite place... damp grass. Months back, I bought my first Lensbaby lens to celebrate my 30th birthday. And just now I'm beginning to get it working the way I'd like it to. The shining example is the aperture accessory kit that I bought with the lens to give me bokeh (the aesthetic quality of the blur) in the shapes of the aperture disks. Up until a few days ago, I was disappointed with the results I was obtaining. I wasn't getting any shapes in my backgrounds or in my light sources at first... That is until I realize what I wanted depended on the field depth. 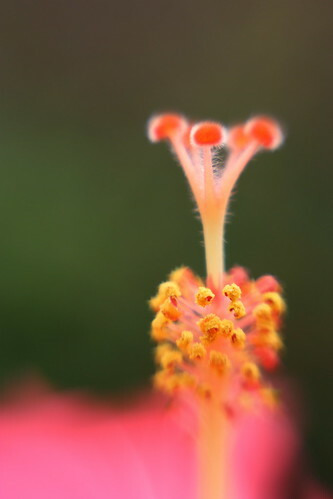 The way to get some shapely bokeh is to have bokeh in the first place! 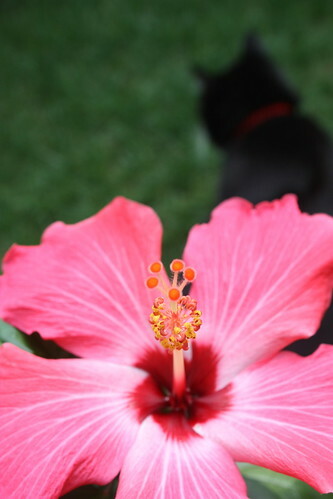 These first two photos are taken with my stock Canon Rebel Xsi lens to show the standard lens look. The next photos showcase the Lensbaby double glass optic in the composer lens body with the star aperture in place. 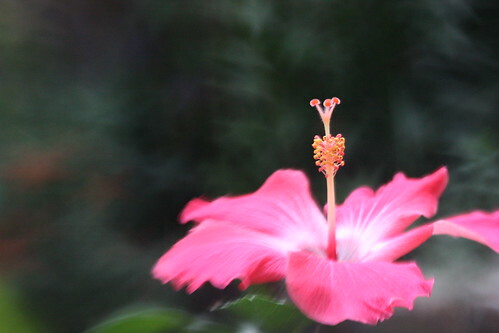 As you can see, the other plants in our yard give a nice blur with the lighter plants have star shaped bokeh. 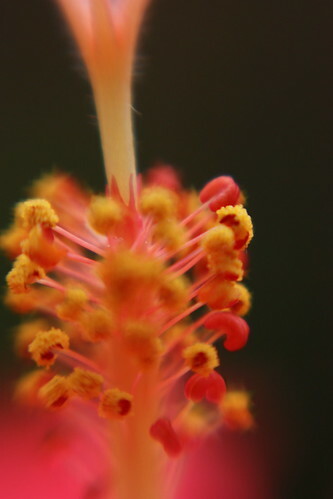 I also offset the point of focus to the side to capture only the flower and at one point just the stamen in focus. 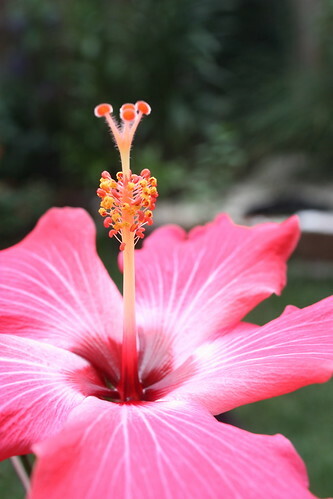 Then I decided to play a bit with the macro lens adapter I bought. Putting on the +10 first and then the +10 combined with the +4. 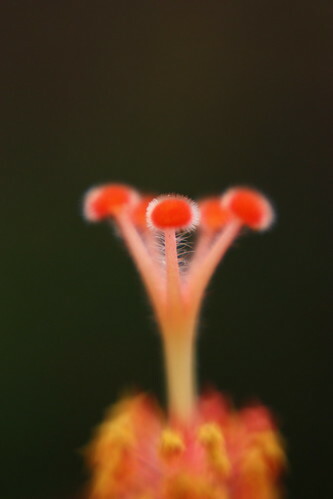 I admit that it was quite a challenge to get a perfectly focused macro photo without a tripod. Plus it doesn't help that I'm still working on tweaking my diopter to work with the Lensbaby. I actually had to buy a dioptric adjustment lens to make my stock diopter more dynamic as I was maxing out the negative side of it to attempt to get focus. The only thing I'm not really fond of is having to use my camera in Aperture Priority mode as I can't select the exposure time. But as the Xsi doesn't allow me to indicate aperture size and the light meter ceases to function properly in manual with the Lensbaby attached, AP is better than a guessing game for exposure time. Despite that, in the end I'm loving the little bit that I have learned about using my Lensbaby and I can't wait to play with it more so that using it becomes natural like my canon stock lens. 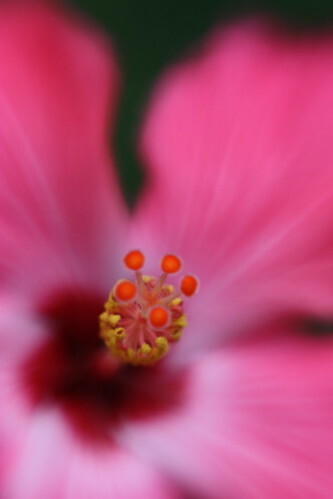 Anyone else out there try a Lensbaby yet? "You Killed my Saturday ..." will be entered in Paper Mama's contest! Thanks for all the help everyone here and on facebook! More recently, I've begun to want my photos to tell stories. 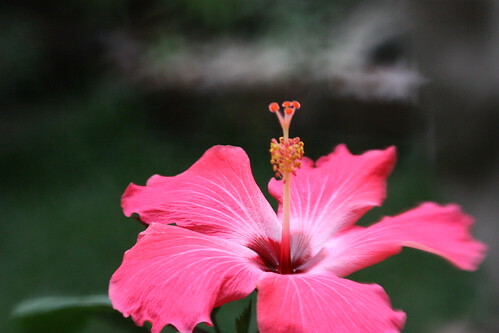 When I first started to photograph, I was content on catching pretty objects, scenery, cats, etc. While that is all well and good, it tends to be more just a practice in catching the right layout, color, contrast... the right type of shot. Looking back at those photos, I find that they are of great quality but don't remind me of a moment. They don't evoke as much of an emotion as others. So hence my new desire to catch moments. Oddly enough this new desire has occurred before the most recent Paper Mama challenge to show off your "Best Shot" of your child or pet. "Sleep With One Eye Open"
The next photo was one taken a few weeks back. The story behind "The Winker" is as follows... I had no desire to get up on that particular Sunday morning so I continued to lay sideways across the bed until I figured out what I wanted/needed to do. My husband decided to pester me and our 2nd youngest kitty Scout decided to join the fun on the bed. Out of sheer luck, the cat & the husband aligned in a such a way that I saw a perfect rare shot that could never be set up like that again. Slinking off the bed to not disturb the cat (as you know they don't stay long when there is movement around), I ran to snag my camera. I slipped back across the bed with all the auto settings on so I could catch the moment before Scout ran off. Sadly, the autofocus went for the close face... my husband (Pre-Wink). 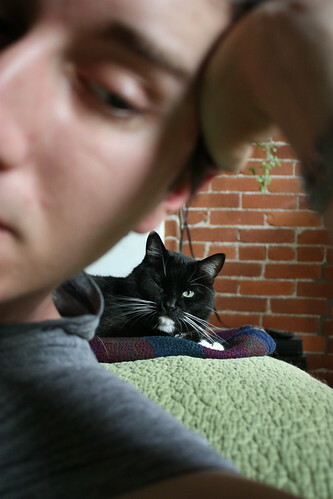 Switching to manual, I focused on the kitty who just as I clicked blinked his one eye. And Voila... The winker was born. The third photo was one taken shortly after we moved. 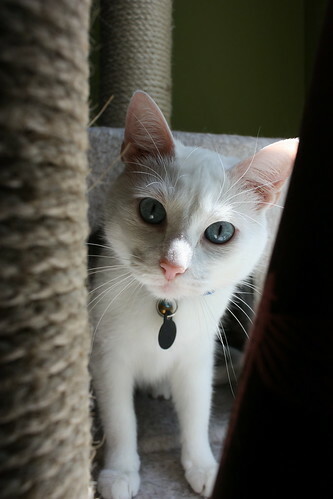 Our youngest and littlest kitty out of the four, Alice, was playing on our cat tower behind the window curtain. She was cooing and mewing as she does to get attention. And the sunshine through the window was shining bright making her baby blue eyes sparkle. So I snagged my camera and began to line up a shot. Upon seeing she was being given attention and wondering what I had in my hand, she peaked forward to sniff and I caught this little gem called "Hide and Seek". My final and fourth photo is still coming... See our OC (old kittycat - he's 11 yrs old), Roscoe, doesn't stick around much to be photographed. 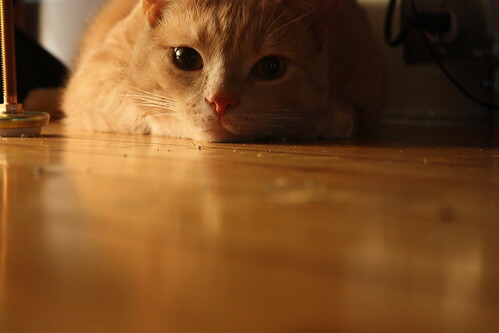 He's shy and afraid of most everything. He's a watcher and a looker. Currently one of my favorite photos of him is where he's playing with his gator (named "Gator Play"). For some reason he loves to play with this plastic gator. It goes missing for years before I find where he hides it. This particular night, I had found the gator and pulled it out for him to play. As you can see, everything is in focus but Roscoe as he baps at his toy. 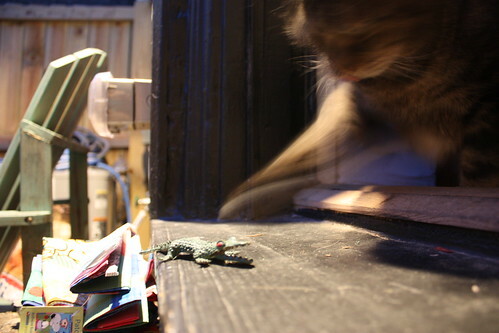 While I love this photo because my 11 yr old cat is playing with his gator, I'm sure I can get a better shot of him... I just have to time it right. Hence why Roscoe's best is still to come. So which one do you like the best for "The Best"? Posting is open until June 24th for paper mama so tell me which I ought to submit as I love them all! I'll give you until Friday the 17th Sunday the 19th to comment on your favorite photo that would be a good contender for this Paper Mama contest... it has prizes! eep! When you hit the gallery show photos, I'd suggest clicking on different sets as the show photos are MANY(hundreds...I think)! So I'll keep this short and sweet as I have about a million things to do and don't want to do a thing. Today is a rather somber day for my husband, his family and I as we say goodbye to his grandma Dee. That tough old cookie, who was only given a short time to live last summer when diagnosed with bone cancer (her third and final battle with cancer), has left her pain and this world for a much better place. We're glad she proved the doctors wrong and made it to our wedding last September but are still wishing she didn't have to go so soon. She was only 82 years young... We like to think she's hanging out at the Isaly's (a local Pgh deli that her and the old folks hung out at) in the sky with all her friends who have passed before her. In memory of grandma Dee, I'm posting my best face of the May for the "I Heart Faces" photography challenge... one of our kitties. Grandma Dee loved animals, in particular pussycats! So it's only fitting to put up a kitty that we so wanted her to meet. She only got to meet 1 of our 4 furballs and we're sure had she met our little Alice, she would have fell in love. ps. I know we need to comment on photos around ours. And I promise to do so. I just might not be able to for a day or so while we sort life out. But I had really really really wanted to post this photo when I saw the info for this week's contest in last weeks. Oh and sorry it's not a human face.... But I don't think my husband would feel much like being photographed anytime soon... nor do I feel much like photographing. 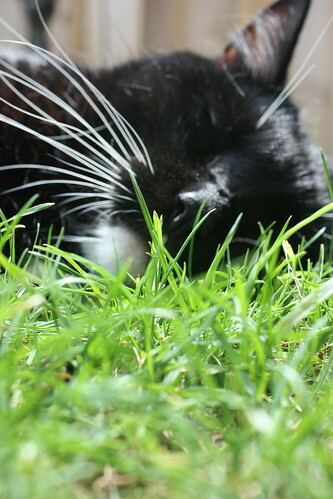 Plus as we don't have fur-less children yet, our cats are who I photograph as if they were children. Weird. yes I know. But they put up with me when my husband gets sick of posing... If it has to be a human face from may... then below would be it. "Yesterday's sorrow" taken yesterday when I was trying to cheer up after my last visit to see Dee. Or maybe even the "Winker"... When my husband, cats, and I were all happy and chipper. Also... 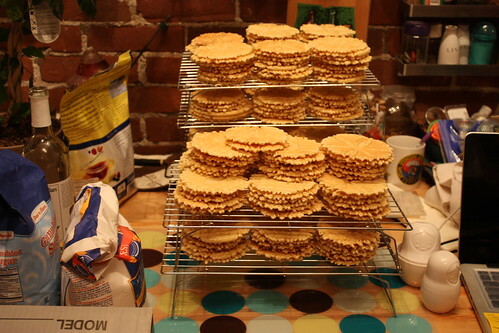 I cooked 21 dozen pizzelles this weekend. Here's the dets for the bake sale auction from the site. Are you as excited as we are for the #OperationLayla: Bake Sale? This Wednesday, you can feast your eyes on more than three dozen varieties of baked goods, and everyone knows that tasty treats have zero calories if it’s for a good cause, right? 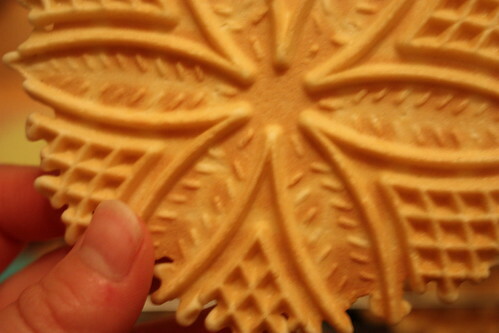 So get your money ready, because tomorrow you’ll see items like Cinnamon Rum Caramel Sauce and Homemade Pancake Mix; Turducken Cookies (chocolate chip cookies stuffed with an Oreo! ), Toffee Bacon Shortbread, and mouthwatering brownies, cookies, cakes, and pretty much everything in between! There will also be vegan and gluten free goodies and several items available for international shipping (just make sure to read each post for more specific details)! You may be asking yourself how this online bake sale will work, so here are some need-to-know facts for the big day. The bake sale will open at 8 am on Wednesday, March 16, and closes at 11 pm EST on Wednesday, March 16. On Wednesday morning, there will be a post opening the bake sale. Each item will have a minimum bid of $15. Each item up for bid will have its own post. To officially bid on an baked good, you must leave a comment on that particular post with at least a $1 (one dollar) raise in price. Think of this as an on-going auction. Readers will see the last price and have the option of raising it higher. All buyers have until 11 pm EST to submit their bid. All winners will be announced on Thursday, March 17. Each winner will donate the specified winning amount through the#OperationLayla PayPal button. Once the donation goes through, I will email the baker the winner’s email address. It will then be the baker’s responsibility to get in touch with the winner to work out the specifics of sending the baked good(s). The winner has 24 hours to make the online donation. 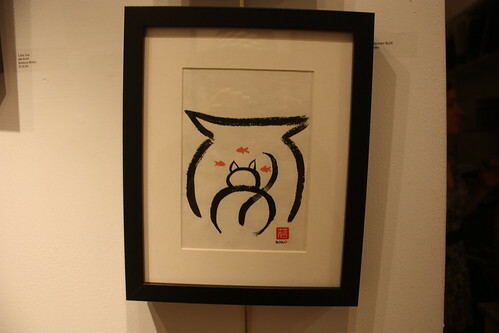 If, in that time frame, the donation is not made, the next highest bidder will be contacted. Thank you very much for your generous contributions and support. We will try our best to moderate the comments throughout the day. If you would like to comment anonymously or have any questions or concerns, please email OperationBakeSale@gmail.com.